Home|Floral Library|Pincushion – Leucospermum spp. Decorative Life: At least 10 days fresh and much longer dry. Harvest when about 25% of the flowers in a head have straight styles and the rest are loosening, often referred to as looping. Sores best at 32-34 F, provide light during storage to prevent leaf blackening. 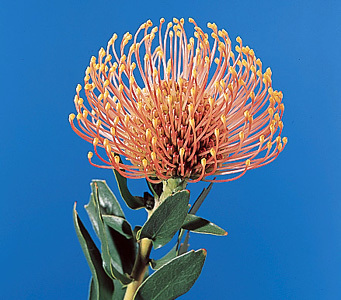 Does not store as well as some other members of the protea family. Namely, some may not do well after only one week of storage. Others can be stored for 3 weeks with 1 week left of vaselife. Named for the Latin meaning white tree or white seed. From Greek “leukos” (white) and “sperma” (seed). It is so suitable for drying that flowers used in fresh arrangements can often be left indefinitely in the vase, long after the water has disappeared, and still retain much of their beauty. Leaves can tun black due to low light and especially due to lack of carbohydrate. Therefore, make sure a fresh flower food containing sugar is used.